Both parents are KC registered .History of good hip scores.UPDATE. d n a tested and tested CLEAR of Cerebellar Ataxia .authentication code cert available on request. and vet.health check. Hi . Lola our adorable .well socialised pet . the daughter of sugar Rego of Hungary who arrived in the uk. from the world famous sugar kennels in Budapest. champion lines. 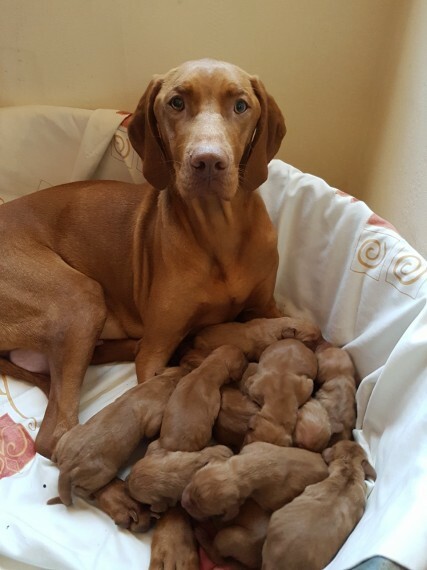 Has Given Birth To A Litter Of Healthy Adorable Puppies .5 Boy..s And 5 Girl..s . sire from good uk pedigree .Reidolvalley Heartbreaker. also champion lines ...Pup..s Are Available to view. Puppies will come with the following. 1. KC Registration papers with Endorsements 2. 5 weeks free insurance 3. Puppy food 4. Puppy care guide 5. Sales contract 6. free microchip transfer fee 7. Lifetime support 8. health check Please contact me to register interest. Delivery available to good homes.